Craving a fresh and flavorful summer dinner right from the grill? Start with easy to grow herbs! They give your favorite grilling recipes and classic cocktails rich and delicious flavors. Nothing says summertime like a watermelon mojito and mango bruschetta! Or compound butter and herb-infused marinades! Check out our tips and recipes below for a fun, garden-fresh approach to cooking with herbs and veggies. 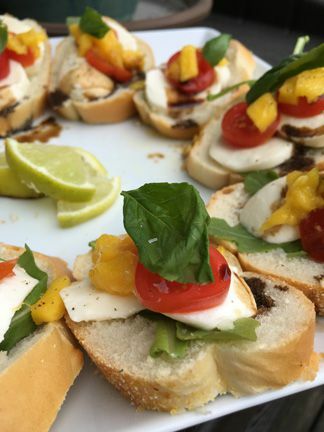 Bruschetta is an easy crowd-pleaser, and with a dash of mango salsa and lime, you can take this classic Italian favorite and infuse a bit of multi-cultural flavor for a delicious, fresh bite. A classic and wonderful trio is rosemary, sage, and thyme. Highly aromatic, these herbs can be used in a marinade to flavor beef, pork, lamb, and fish. The method is very simple: mix oil with herbs and lemon juice, wine or vinegar. Marinate the meat in the liquid until the flavor is absorbed. Or, thread leaves of sage between chunks of beef or lamb in kebobs for an aesthetic, tasty flare. Adding herbs to grilled shrimp is fast and easy. Simply mix oregano and thyme, either the standard uprights of the English or French variety, with oil and lemon juice. Brush atop the shrimp as they grill for a delicious glaze. Also, the swollen base of Florence fennel (a celery-like vegetable) is fabulous grilled! Flavored butters enhance grilled corn and other grilled vegetables and are wonderful on seafood, steaks, and chicken. Dill, parsley, basil, chives and tarragon are very popular in making herb butters. Just combine fresh herbs with softened butter and salt and pepper. Spread some on any of your grilled veggies, meats, fish or bread. In a small bowl, combine all ingredients. Mix well until herbs are evenly distributed. Dump onto a piece of waxed paper or parchment, shape into a cylinder or disk, and seal ends by twisting or packing into a ramekin (however you prefer to store and serve it) and cover it with plastic. Chill in refrigerator until firm, at least an hour. Will keep in the refrigerator for about 2 weeks and in the freezer a few months. Keep cool with beverages flavored with herbs. Use lemon balm or lemon verbena to flavor your water or iced tea. You can also freeze herbs in ice cubes for a colorful and flavorful treat. Borage, especially the blue flowers, and salad burnet are traditionally added to summer drinks. 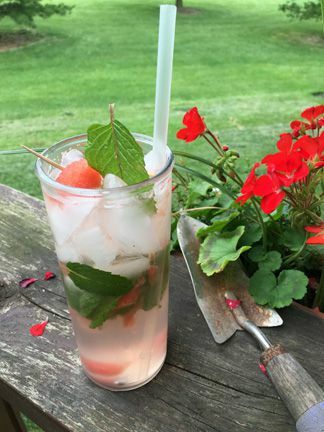 And, for a spirited kick, try this watermelon mojito recipe. Take your pre-bought watermelon and reserve part of it for scooping and making watermelon balls for the garnish. Take the remainder of your watermelon and cut it into chunks for muddling. Take 3-4 chunks of watermelon and 5-6 leaves of spearmint and put them into the bottom of a Collins or pint glass. Now, add 1 ½ ounces (one shot) of white rum. Muddle the watermelon, mint and white rum – infusing the alcohol lightly. Add 1 ounce of simple syrup, which you can make at home by boiling equals parts sugar and water and then allowing to cool. Or, simply add 2 teaspoons of sugar during the muddling process to grind the sugar down. Then, add ice to the top of the glass. Top the glass off with soda water. Finish with the juice of two limes, drop them in the glass. Add your scooped watermelon ball onto a cocktail skewer and voila! Try making a pitcher at your next party!